I stumbled on the wings at Milwaukee Ale House one night when my family ordered the sampler platter. Did these wings blow me away or where they just a deep fried fill in? All the chains like Applebees, T.G.I. Fridays, or Chilis have wings and have a sampler platter that usually includes wings. I’ve never been impressed with wings at any of these places honestly. You can tell they are frozen, and the sauces are always just boring old throwaway flavors like Buffalo, BBQ, or Asain. Don’t get me wrong, I love me some Buffalo and Asain wings, but typically these places sauces are as bland as can be. I generally don’t expect much when I see wings that come in a sampler platter. Milwaukee Ale House isn’t a chain by any means, but I kind of got that feel on my first visit. I was with my wife and her family, and we were all headed to a friends wedding. It was that in between time, between the ceremony and the reception, we all were kind of hungry and wanted a beer. Milwaukee Ale house was right near by so that’s where we ended up. We didn’t go their to fill our bellies, just for a little snack to hold us over, so we ended up ordering the appetizer sampler platter which came with your standard fair Onion Rings, Mozzarella Sticks, Potato Skins and of course, Wings. Again, even though Milwaukee Ale House isn’t a chain, it sort of felt that way, so I wasn’t expecting much. I also don’t recall a single person recommending that we check them out for wings, which, if a place has decent to good wings now-a-days someone lets one of us know. So again…loooow exceptions. The wings came out and visually, I could tell they were cooked perfect and they weren’t standard fair wings. Surprise, surprise. The skin looked perfectly crispy and I could see on the ends that they were just a little darker in color, a sign of a perfectly crispy chicken wing. Magoo’s, and Points East are perfect places to try a wing that is cooked that way. I picked one up, and my eyes did not deceive me. My one handed eating technique worked like a charm with the crunchy skin. 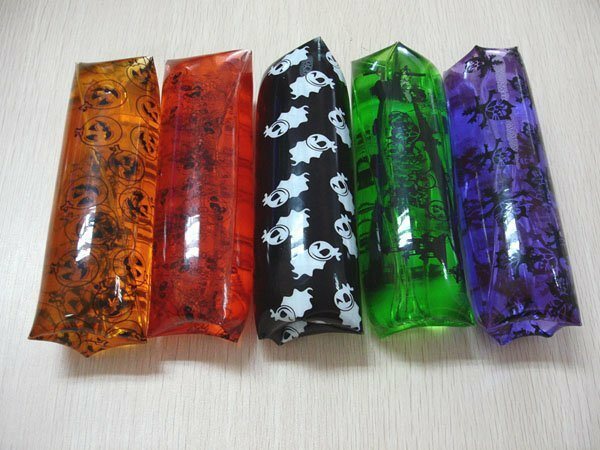 No slipping out like one of those water filled tube toys (like this). I HATE wings like that. Milwaukee Ale House wings are on the opposite end of the spectrum. So the skin and doneness was just right and so was the size. Not big or small, but exactly medium allowing for an excellent sauce to wing ratio. The sauce itself was a thinner, vinegar based sauce, and wasn’t heavy or sticky like a BW3’s sauce. The flavor was buffalo-ish, but on the unique side with it’s own individual taste. The flavor itself reminded me of the extraordinary sauce at Sweet Water in Detroit, which if you haven’t been paying attention is mine, and most of the guys in the group’s favorite wings evar. I knew these wings weren’t just fried and my thought was that there were fried then grilled, which is a process I’m quite fond of. I asked our waitress if the wings were indeed fried then grilled. Without hesitation she told me that they were just fried. I didn’t believe her though. There’s no way you get a wing that perfectly crispy without over cooking it with just frying it. Unfortunately I wasn’t there to get stuffed so I only got to try out a couple (I had to share…), but I was impressed and knew I needed to come back very soon. Luckily for my somewhat OCD personalty I would get back there just a few weeks later, ironically to meet up with some clients about doing photos for their wedding. When Nick told me were meeting the client there for dinner I was definitely excited (glad it wasn’t Chili’s or Applebee’s) and let him know the wings there are awesome. This would give me another opportunity to try them out. We met the clients at Milwaukee Ale House on a Friday night to talk about the wedding plans, and Nick and I got along with the Bride and Groom very well. The groom was actually really interested in our site and is a foodie himself so he could appreciate my passion for good wings. He ended up ordering the wings as well. I ordered their lb of wings with their Hot Sauce, and I’m happy to report my initial impression was right on…indeed these wings were awesome. I ripped through these wings in no time at all, each bit just as satisfying as the last. I barely stopped to wipe my face or make small talk. We held off on any of the important wedding talk until we were done eating. Taking a closer look at the wings again and savoring the flavor I knew the wings weren’t just fried. When our waiter came back around I asked him how the wings were made. He said he thought they were fried, but he wasn’t 100% sure and offered to go ask the chef. He came back in a couple minutes and I was close. There’s weren’t fried then grilled, but they were put in the pizza oven first, then grilled. I haven’t heard of that technique, but let me tell you it results in a fantastically cooked wing. The crispiness is just perfect. Again, the wings at Milwaukee Ale House were outstanding. I love stumbling on a place and being totally surprised by their wings. Unfortunately it doesn’t happen as much as I’d like for as often as I eat wings now-a-days. I’d put these wings easily in the top 10 best wings I’ve had anywhere. Maybe, even my top 5. The wings are grilled in the pizza oven then fried befor serving and the sause is franks red hot. hope that clarifies things for you and yes i was an employee for awhile so i know fo sho. I just remembered that he also told me they dry rub them before they go into the pizza oven. That must be what gives it the unique taste if they are just using plain old Franks.